I have to start this out by saying I’m at a bit of a loss for words about this game. I feel awful for everyone associated with Drexel women’s basketball. My wife thinks I should focus on the positives of the Towson story so we’ll start with that and go from there. 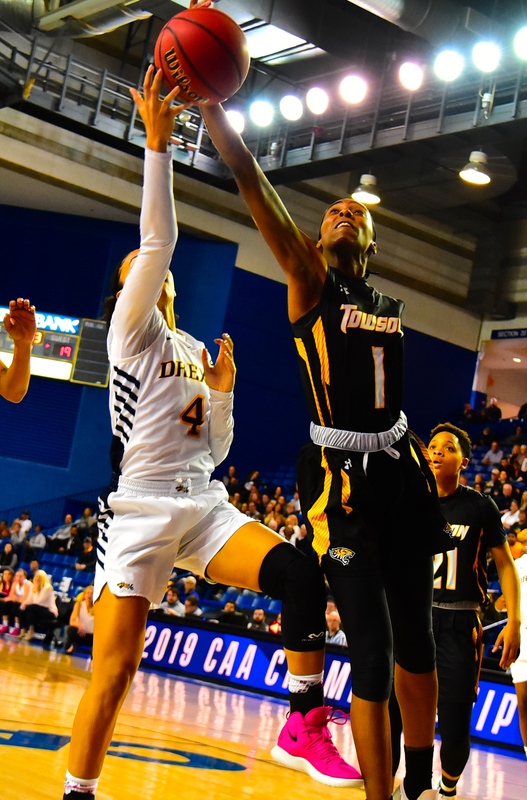 The Towson Tigers used two key midrange jump shots in the final minute to beat the Drexel Dragons 53-49 Saturday afternoon at the Bob Carpenter Center in the championship game of the CAA Women’s Basketball Tournament. The win clinches the program’s first ever NCAA Tournament appearance. A year ago, the Tigers finished 9-21 and were the first team eliminated from the tournament to end a season that was capped by a 7 game losing streak. Towson’s first year head coach and CAA Coach of the Year Diane Richardson might have just completed one of the greatest single season turnarounds we’ll ever see – in any sport. Somehow she had even more brilliance left in the tank with Drexel ahead 47-46 and less than a minute left in a game that had been a rock fight to that point. The stat sheets for both teams were equally ugly with matching 42% field goal percentages. Drexel “outshot” Towson from three point range at 24% to 23% and had one more turnover at 16 compared to Towson’s 15. Buckets were hard to come by for the Dragons as Senior Center Maia Lee for Towson clogged up the post and held Drexel’s Niki Metzel to 10 points on 4-10 shooting. It became a defensive game which shouldn’t come as a surprise considering Drexel’s defense has consistently ranked as one of the best in the country. 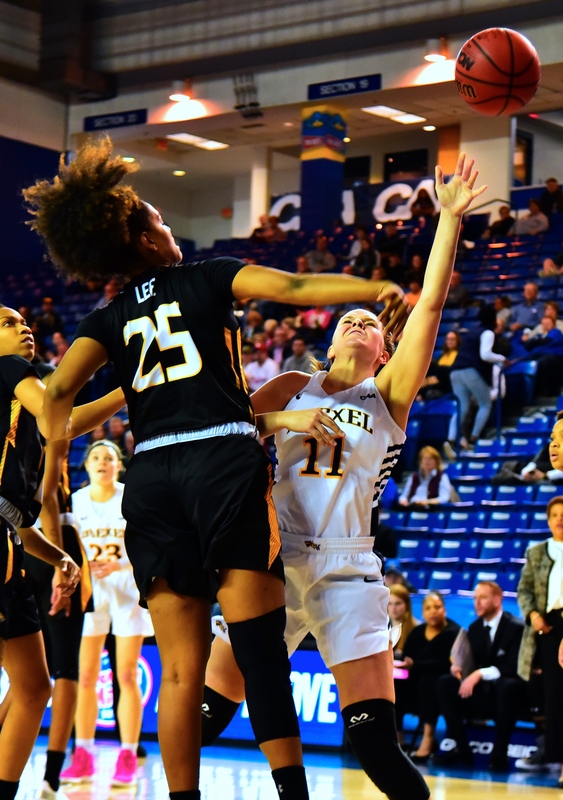 What was a bit of a surprise – and ultimately doomed the Dragons – was Drexel could never come up with enough offense to put Towson away. Even a quick 5-0 run to push several of their leads to three or four possessions might have been enough. 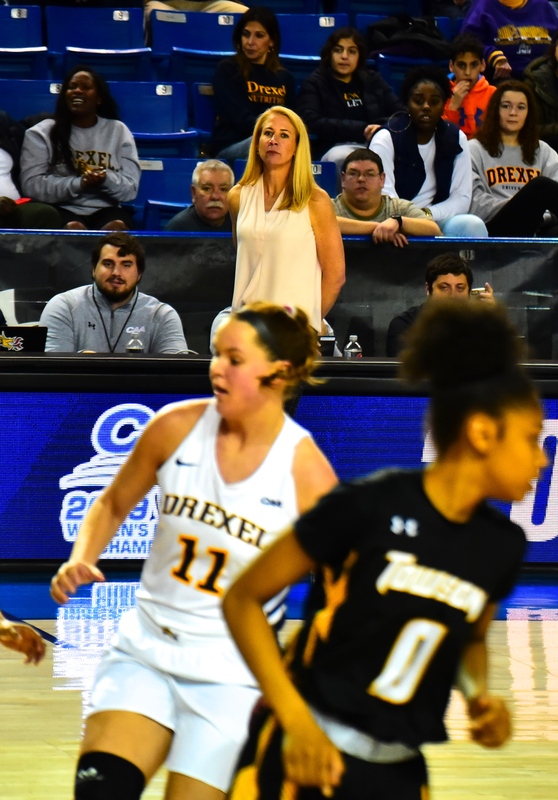 Drexel head coach Denise Dillon seemed determined to let her star player Bailey Greenberg win the game from the post, but a combination of great Towson interior defense and just some sloppy passing and ball handling prevented this from becoming a reliable option. Without a reliable place to go for points, Drexel could not extend their 46-43 lead at the 3:07 mark of the 4th quarter following an Aubree Brown layup. It was their only 2 fast break points of the game compared to Towson’s 13 as it seemed like the Dragons had to fight for every basket especially down the stretch. A layup off a Drexel turnover by Towson’s Qierra Murray erased Brown’s layup to make it 46-45 with 1:41 left. 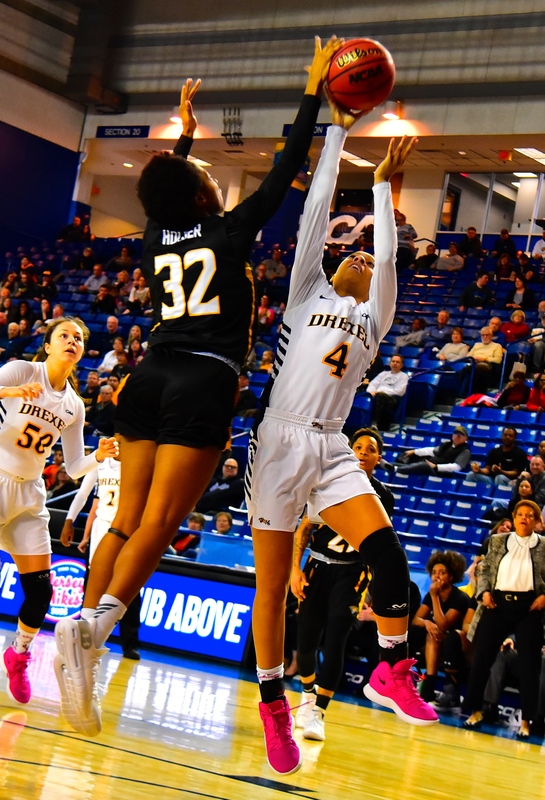 With Drexel essentially handcuffed offensively, Towson went to work with a series of clutch possessions that Northeastern couldn’t produce with a similar opportunity in the semifinals against Drexel. Midrange jump shots by Nukiya Mayo and Kionna Jeter off well executed screens put Towson up 47-46 with 54 seconds left. A stunned Drexel team turned the ball over on the ensuing possession and clutch free throws by Mayo essentially sealed the game in the closing seconds. Mayo would finish with a game high 20 points. I said at the beginning I was at a loss for words because this is a crushing loss for Drexel women’s basketball. They’ve always been the source of hope for all of us who think that Drexel basketball – men’s and women’s – should be better. They are the centerpiece for an athletic department that fails to consistently produce championship contenders in pretty much every sport. I live a mile from Messiah College and while it’s at the Division III level, it has been eye opening to be around an athletic department that consistently produces winners in sports like men’s and women’s soccer, field hockey, and women’s basketball. I still think this team is a source of pride and I love this team, this program, and especially this coach who wins at a place where nobody else thinks it’s possible. If you’ve ever seen a game at Towson’s SECU Arena, or College of Charleston, then you can see the different between a University that makes an effort. Coach Dillon and her teams put themselves in positions to win championships on their own, without significant long term capital support – while at the same time doing all the right things. Coach DIllon and her teams have deserved more than the one NCAA Tournament appearance in 2009. Unfortunately sports are not fair and as much as we all wanted today to be the day they went dancing again, it was not to be. So what might it take for Drexel to repeat that magical run in 2009 where they were the first team to beat ODU in nearly 20 years? I think the answers might already be on the roster. 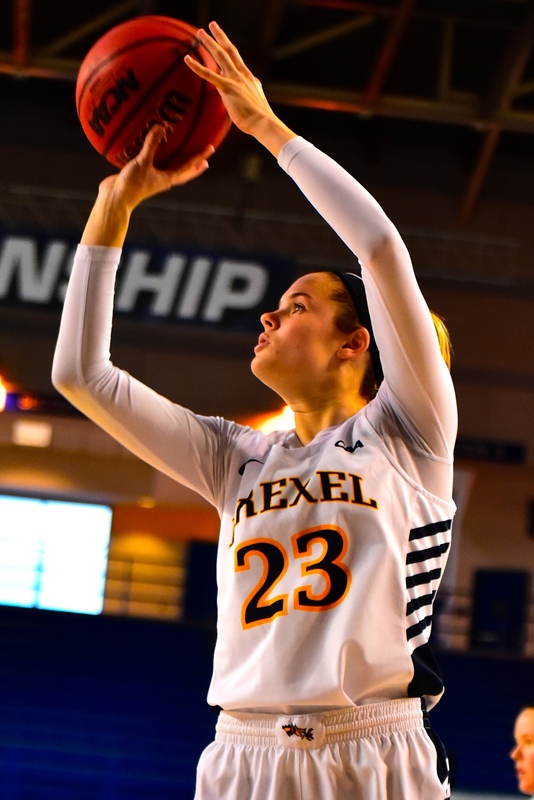 Just as Towson lived by the jump shot today, Drexel died by it, but Niki Metzel was a bit of a revelation in the tournament as a consistent post player. Keishana Washington and Maura Hendrixson were huge additions as freshman. Washington has athleticism that we haven’t seen in Drexel guards over the years and is a bit of a departure from what Denise Dillon typically has running her offense. They will be anchored next year by seniors Bailey Greenberg and Aubree Brown who are poised to become one of the greatest tandems in program history. Brown has always seemed on the verge of taking flight the way Greenberg did this year. One area the Dragons are going to have to work on is toughness against physical teams. The only other stat that was lopsided today was offensive rebounds as Towson pulled down 13 compared to Drexel’s 6. The second half started with Drexel having to defend two possessions because they gave up offensive rebounds. They are going to have to win those types of battles especially if their offensive production doesn’t pick up next season. I believe in Denise Dillon and I’m hoping she believes in herself as so many of us do. If I was in her shoes, I would be doubting myself, just because I’m a competitor driven to succeed but in a different line of work. The people who are most successful are often the hardest on themselves especially in the face of failure. I saw her take a deep breath on the way off the floor, probably because she was about to face a locker room full of her heart broken players. It breaks my heart for her and the program that they couldn’t get it done today. But she brings back one of her most complete rosters with a star player the likes of which she hasn’t had since Gabriela Marginean. The sun will come up tomorrow and they’ll start getting ready to take another shot at the title they deserve.